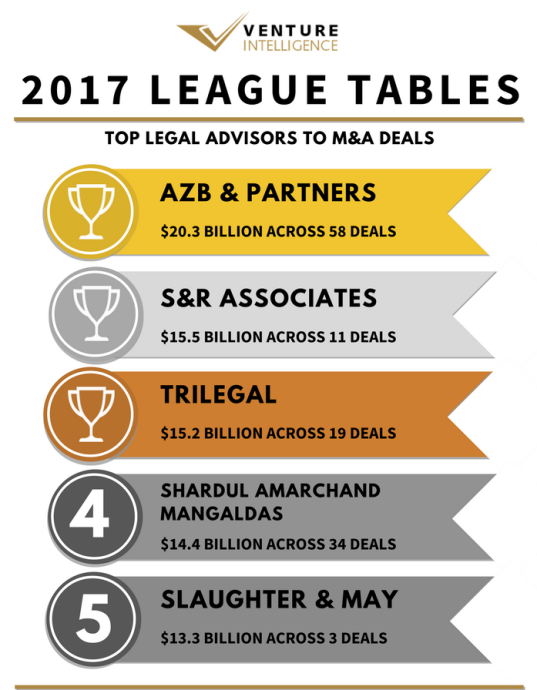 AZB & Partners topped the Venture Intelligence League Table for Legal Advisors to M&A Transactions in 2017. AZB & Partners advised M&A deals worth $20.3 Billion (across 58 qualifying deals) during the period. S&R Associates ($15.5 Billion across 11 deals) and Trilegal ($15.2 Billion across 19 deals) followed next. Shardul Amarchand Mangaldas ($14.4 Billion across 34 deals) occupied the fourth spot while Slaughter May occupied the fifth spot in 2017. The top seven firms in the M&A league table - including Bharucha & Partners and Vaish Associates - were involved as advisors to the mega Vodafone-Idea Cellular merger. In 2017, the Telecom industry driven by the consolidation, was the biggest source of mega sized M&A transactions. AZB was the legal advisor to major deals including the American Tower Corporation acquisition of tower businesses of Idea and Vodafone and the deals by Bharti Airtel with Tikona Digital Networks, Telenor and Tata Teleservices. The legal advisors to the second largest deal - Reliance Communications - Reliance Jio - included CAM, J Sagar Associates and Khaitan & Co.
AZB topped the tables in terms of deal volume as well in 2017, with Khaitan & Co. (50 deals worth $6 Billion) and Shardul Amarchand Mangaldas (34 deals) coming in next. Cyril Amarchand Mangaldas (31 deals worth $9.1 Billion) finished the at fourth spot while HSA Advocates (with 23 deals worth $1.6 Billion) took the fifth spot. In Financial Services, AZB topped with $3.2 Billion, followed by CAM ($3.1 Billion) and S&R Associates ($2.4 B). By deal volume, AZB and Khaitan shared the top spot with 10 deals each, followed by Trilegal and CAM in second spot with 5 deals each. DSK Legal and J Sagar Associates shared the third spot with 4 deals each. In IT & ITeS, Simpson Thacher & Bartlett and Sullivan & Cromwell topped, advising the $2 Billion Altran Technologies - Aricent deal. SAM ($460 million) and CAM ($412 million) occupied the the second and third place respectively. Trilegal and Khaitan completed the top five. Khaitan & Co. topped by deal volume with 13 deals, followed by SAM (11) and AZB (8). In Manufacturing, AZB topped with $1 Billion across 10 deals, followed by CAM ($970 million) and White & Case ($609 million). PDS Legal and HSA Advocates occupied fourth and fifth spot. 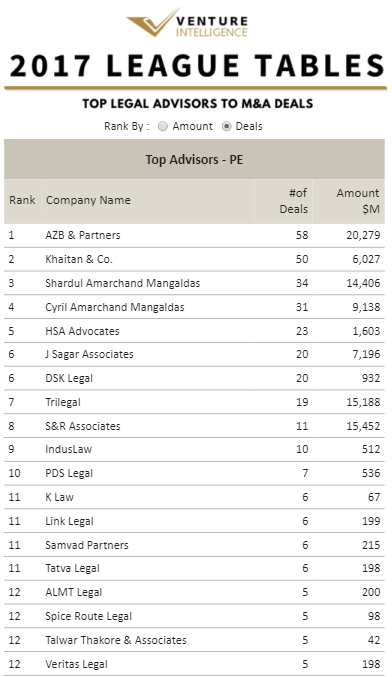 AZB also topped by deal volume, followed by Khaitan and DSK Legal tied at second place with 7 deals each. In Healthcare & Lifesciences, Khaitan and Desai & Diwanji occupied the top spot with $554 million. DSK Legal ($215 million) finished at second while IndusLaw and ALMT Legal finished at third respectively with $200 million. In Energy, J Sagar Associates ($2.9 Billion) followed by Trilegal ($900 million) in second place. HSA Advocates ($535 million) finished at third place. In Real Estate, CAM topped with $230 million, followed by AZB ($165 million) at second place and Ropes & Gray and Simpson Thacher & Bartlett at third place with $157 million.